The Volta River Basin (VRB) is an important transboundary basin in West Africa that covers approximately 410,000 square kilometres across six countries: Benin, Burkina Faso, Côte d’Ivoire, Ghana, Mali and Togo. Its natural resources sustain the livelihoods of its population and contribute to economic development. This book provides a comprehensive, interdisciplinary review and assessment of the issues and challenges faced. The authors provide a science-based assessment of current and future scenarios of water availability, the demands of key sectors, including agriculture and hydropower, and the environment under changing demographic, economic, social and climatic conditions. They also identify solutions and strategies that will allow available water resources to be sustainably used to improve agricultural productivity, food security and economic growth in the VRB. Overall, the work examines from a multidisciplinary and multi-stakeholder perspective the solutions and strategies to improve the use of water and other natural resources in the VRB to achieve enhanced food security, livelihoods and economic growth. Timothy O. Williams is Director for Africa at the International Water Management Institute (IWMI), based in Accra, Ghana. Marloes L. Mul is a Senior Researcher in Hydrology and Water Resources at the IWMI, Accra, Ghana. 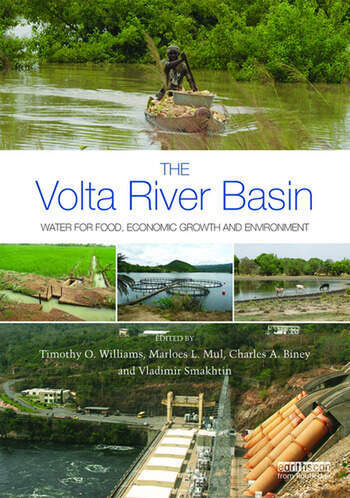 Charles A. Biney is Acting Executive Director of the Volta Basin Authority, based in Ouagadougou, Burkina Faso. Vladimir Smakhtin was Head of the Water Availability, Risk and Resilience Research Department at IWMI, Colombo, Sri Lanka. He is now the Director of the Institute for Water, Environment and Health (UNU-INWEH), based in Hamilton, Ontario, Canada.